Tudor is a British architecture style that joined the Renaissance decorative elements to the Gothic Perpendicular Gothic Style between 1485-1558. Tudor houses can be as big as Hampton Court or as small as the Penshurst Place, Kent. The purpose of the Tudor manor house is to have a comfortable space for living but also to show off wealth and social status during Medieval England times. Present Tudor house revival architecture can be found all over Great Britain, Northern Europe, and the United States. In the US, Tudor style took a variety of forms from elegant mansions to simple suburban homes. The style became popular in the 1920s and 1930s. Modified versions became a fad in the 1970s and 1980s. Tudor houses were mostly half-timbered and have a wooden frame with spaces between filled with sticks and wet clay (wattle and daub). The most distinct feature of the Tudor house was the black and white effect due to exposed frames. A Tudor house often has these features that made the style distinct: decorative half-timbering, a steep-pitched roof, striking cross gables, tall and narrow windows, small window panes, and huge chimneys. The wattle and daub method in constructing a Tudor house has been used for over 6,000 years as a building material from North America up to Western Asia. The main ingredient to make the daub was animal dung. Owning a Tudor house in Medieval England was already a social status. However, elites always had to outdo each other; and one way to impress the same social class was to have an impressively designed garden. During the reign of Elizabeth I, Penshurst Place owner Sir Henry Sidney wanted to lift his status much higher, thus the creation of a 360 feet by 300 feet formal garden. Tudor houses didn’t have toilets; they had “privies” instead. Privies were bowls with a piece of wood and a hole carved on top and set on hollows called a “garderobe.” Garderobe is a French word for “wardrobe,” describing a place to store a medieval toilet, clothes, and other items. Tudor houses had lattice windows made of small pieces of glass held together by strips of lead. In the 15th century, only a few people could afford to have glass windows; so when they moved from the house, they took their windows with them. Tudor home furniture was made from oak wood and ere elegant, carved, and heavy. Furniture was pompous, carved, and painted to reflect the English Renaissance. Sideboards were made for fashionable displays; feathered beds replaced straw mattresses; and four-poster beds came in style. 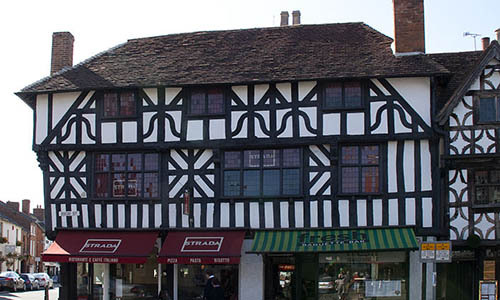 Some Tudor houses had upper stories bigger than the ground floor. The place where the upper stories would overhang was called a “jetty.” The origin for the design is still not known. However, if located in a town, the jetty would give you an enlarged floor space with maximum street width. In rich Tudor households, they used beeswax candles to light their houses. The poor used tallow or animal fat; and the poorest used rush lights, which were dipped in animal fat. Chimneys were status symbols for a Tudor house. During the Middle Ages, a rich person’s house was dominated by the great hall. It was not possible to build a room above the hall because the smoke would not have an outlet. Thus, rich people’s houses were divided into more rooms. Due to the expensive price of carpets, wealthy Tudors did not put their carpets on the floor but hung on walls or over the table. Wallpapers were also expensive, so wealthy people hung tapestries or painted cloths on the wall.